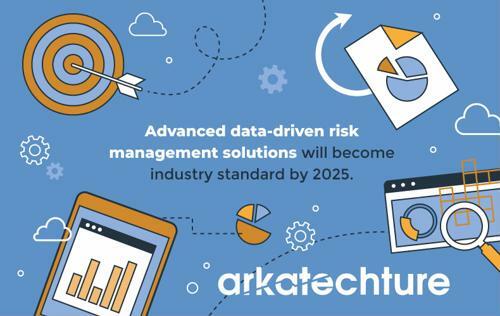 Advanced data-driven risk management solutions will become industry standard by 2025. The big data revolution has transformed numerous industries, including the financial space. More than three-quarters of financial services organizations incorporate large-scale enterprise analytics platforms to optimize operations, according to researchers from Dresner Advisory Services. While many of these implementations are relatively immature, enterprise technology teams in the sector are working quickly to move this technology forward and catalyze industry-wide growth using the power of information. How will the financial services arena leverage data technology as these tools become increasingly more powerful? Banks and other organizations in the financial services sector have traditionally invested significant resources in risk analysis operations - and for good reason. Institutions suffer serious bottom-line damage when obligors cannot repay on their loans. While the industry-wide volume of nonperforming loans, or credit on which borrowers are not paying, has dropped since the 2008 financial crisis, analysts from the World Bank found that banks are still at risk for losses linked to these products. For this reason, most of these entities continue to optimize their risk analysis strategies in an effort to pinpoint individuals who can reliably pay on their debt. A good portion are turning to data to get the job done. Reliable risk analysis allows banks to tap vast amounts of customer data and more accurately calculate loan risk. For example, loan specialists with access to data solutions can mine social media and other online channels for granular insights that add new dimensions to risk profiles. More advanced data technology can even dig into unstructured data to build extremely robust customer credit profiles. Analysts for McKinsey & Company believe data-driven risk management solutions of this kind will become industry standard by 2025, ushering in a new era of lending stability. According to research conducted by Accenture, customer expectations have increased significantly in the financial services sector due, in part, to the emergence of digital banking channels. Additionally, disparate customer groups have materialized, each with unique service demands. For example, an estimated 78 percent of so-called technology-savvy "nomads" - account holders who are open to banking with non-traditional entities so long as they provide the latest digital offerings - expect banks to function as Amazon or Google would. More traditional customers, coined "hunters," require high-touch services and lower prices in return for their personal data. Fulfilling the needs of these and other groups is no easy task, however, many organizations in the financial services sector have found that big data reduces this burden. Leveraging data at scale allows institutions in the space to track account holders across different channels, lending them the insights they need to optimize their service offerings. For example, a number of the banks are capable of leveraging account closure trends to determine common customer pain points, unpack attrition and reduce churn. One European bank managed to save almost $35 million per year in outflow costs in this manner. Other organizations in the financial services space are using data technology to bolster lead conversion. For instance, U.S. Bank managed to double their conversion rate using customer data to shape its offerings to fit the market. In a few short years, these case studies will become the norm as banks harness the full potential of modern data infrastructure to cultivate transparent and responsive customer service workflows. Organizations in the financial services industry focused on data security long before the age of digital banking. However, many continue to struggle with issue. Banks across the globe continue to misplace customer information - specifically data stored on outdated tape drives for backup purposes, Reuters reported. This state of affairs, along with the looming online threats that accompany digital banking, have put firms in the sector on high alert. Modern data technology has the potential to eliminate some of the risks associated with handling customer data. Such solutions allow banks to relocate sensitive information usually stored in physical tape drives - historical account holder details, for example - to cloud-based web servers to reliably maintain backups and data security as needed. Is your firm equipped to take advantage of these modern data developments?